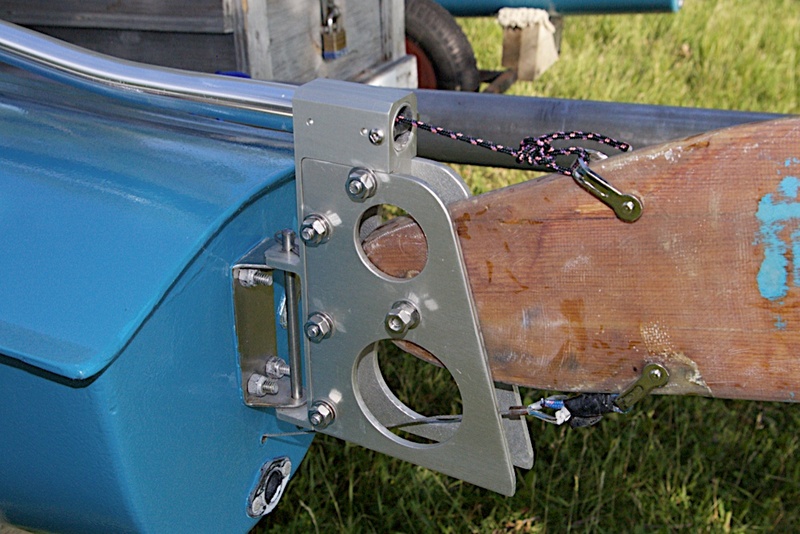 Thru-Hull Rudder Pull Down System | Canadian SeaSpray Assn. This is a potentially easy installation if you are not averse to opening up the deck from the transom to the rear doghouse. Check at your plumbing shop for plastic water line with plastic quick connect fittings. A threaded fitting can be placed in the proper place on the transom to downhaul the rudder blade. The flexible plastic pipe can be attached to the fitting on the transom and have the other end exit the deck from of the rear doghouse to run 4 or 5 inches along the top of the deck. You could glass this short plastic pipe to the deck or attach it in some suitable way to anchor it but not be in your way. Reattach the deck to the hull and run a fine flexible wire through the plastic pipe. Make wire eyes by looping the end of wire using a thimble if desired and a wire grip or ferrule on each protruding wire end with enough play to allow the rudder to fully flip up to its maximum upright position. On the deck side tie enough rope to run from the wire eye to the deck cleat that holds the rudder blade in the down position. At the rudder blade end use shackle (or use a suitable attachment item) to attach the rudder blade to the wire eye on the downhaul wire. Reinforce the rudder blade at the attachment area with fiberglass. This downhaul system greatly reduces the stress on the transom and rudder blade system.